A left bundle branch block occurs when transmission of electrical impulses are delayed or fail to be propagated along the rapidly conducting myocytes of the left main trunk or both the left anterior and posterior fascicles of the conduction system of the heart. 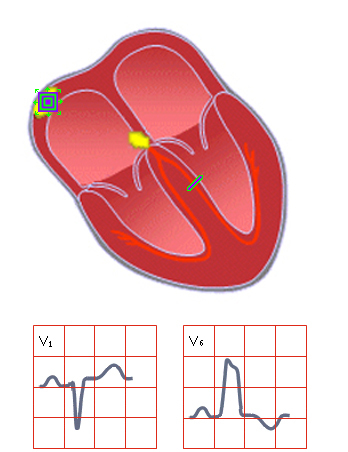 This results in slow myocyte to myocyte conduction of electrical activity from the right side of the heart to the remainder of the myocardium. Slow conduction in this fashion results in a prolonged QRS complex duration of greater than 120 msec. Typical complex morphology of a left bundle branch block includes a deep and wide Q or S wave in V1 (no R wave in V1) with a slurred and sometimes notched R wave in the lateral leads.